One of the greatest 3-D motion pictures of all time has just been released on Blu-ray. Before our review, here's the background story on this classic Golden Age 3-D production. Click on the images to expand. Warner Bros. was first out of the gate to license the Natural Vision camera system used on BWANA DEVIL and announced production of their first 3-D film on December 27, 1952. When production rolled on THE WAX WORKS on January 12, 1953, just about every studio had a 3-D project in development. The popular myth is that DIAL M was not originally announced for 3-D and the process was forced on a reluctant director at the eleventh hour. That is not true. The first announcement hit the trades on April 5, 1953, four months before the first day of filming. With the headline "Hitchcock to film WB's 'M' in 3-D," Jack Warner expressed his confidence in the future of 3-D movies. The opening of HOUSE OF WAX on April 10 at New York’s Paramount Theater was a sensation. Warner Bros. truly captured lightning in a bottle. The film was an unprecedented success and to this day, remains one of the finest photographed 3-D films of all time. In city after city, WAX racked up huge grosses throughout the country and its success was equaled in foreign markets as well. Jack Warner was elated and optimistically announced on May 28 that twenty-two additional 3-D features would go into production. Warners shut down the studio during April, May and June to concentrate on developing their new camera system and to convert all departments to widescreen production. Rather than continue licensing the Natural Vision camera rig that had been used on both HOUSE OF WAX and CHARGE AT FEATHER RIVER, Warner’s optical department, under the leadership of Al Tondreau, designed the new All-Media camera. Similar to Technicolor's Dynoptic 3-D camera system which utilized a pair of three-strip cameras, the Warner Bros. rig placed standard 35mm cameras at a 90 degree angle to each other with a half-silvered “beam splitter” mirror between them. This method didn’t restrict the use of short lenses (down to perhaps 25mm) and was capable of interaxials from 0” to over 6”. The main drawbacks were the critical alignment of the mirror and its heavy light loss, up to 50%. As a result, on-set lighting would need to be increased two and a half times to compensate. However, the All-Media camera offered greater flexibility to other 3-D camera systems and allowed the director and cinematographer tremendous flexibility in how they wanted to present their stereoscopic vision. The new camera would be used for the first time on HONDO. Filming began on location in Camargo, Mexico on June 11. The picturesque landscape would provide the perfect visual setting, but the director and cinematographers had trouble adjusting to the new camera. On June 18, Jack Warner viewed three reels of dailies and was concerned about the lack of close-ups, especially in the scene where John Wayne first meets Geraldine Page. He sent a telegram to the Duke and said "Director is not moving you and Geraldine close enough to camera. Everything seems to be too far away. Must have usual over-shoulder close shots individuals and tight twos in three-dimensional pictures so we can see people’s expressions and everything else." On June 20, John Wayne replied: "Farrow has done everything but play music to get camera in for close shots. Seems our lenses are matted for 1.75 or 1.85 screen, plus fact that cameraman is over cautious for fear front office will scream eyestrain. Will show cameraman your wire. Think it will do the trick. He is really working hard but has limited us in making shots because of his fear and reluctance to do a shot that might throw background lines too wide an angle." Technical issues and bad weather caused frequent malfunctions with the camera, prompting John Wayne (in several heated memos) to demand that Jack Warner send him a camera that worked. Warners finished building a second, improved rig and shipped it to the location. HONDO finally wrapped production in late July and Director of Photography Robert Burks returned to Burbank and immediately began working on DIAL M. His seven weeks of experience certainly worked to his advantage and he must have felt some relief to be back in the controlled atmosphere of a sound stage. Hitchcock and Burks shot make-up and wardrobe tests on July 30 and August 3. During pre-production, Hitchcock expressed his thoughts on working in 3-D and widescreen to Prevue magazine. The popular myth is that Hitchcock prepared for the film and expected it would never play in 3-D. The Boxoffice Barometer to the left is dated August 1. As you can see, THE CHARGE AT FEATHER RIVER, FORT TI, IT CAME FROM OUTER SPACE, THE MAZE, SANGAREE and SECOND CHANCE were doing exceptionally well throughout the country. In fact, Warners own FEATHER RIVER was in its third successful week at the Paramount theaters in Hollywood and Los Angeles. While working on pre-production and gearing up for the start of principal photography on August 5, there's no reason to believe that Hitchcock would have expected DIAL M to go out as a flat movie. Faced with a new camera that still had technical bugs, Hitchcock and Burks worked very hard to achieve the nearly flawless stereoscopic photography in the finished film. Grace Kelly later recalled that shooting in 3-D was "like going into the boxing ring with your hands tied behind your back. I never saw him lose patience -- he never became angry... when the technicians said, 'Oh, no, with the camera we can't do this and we can't do that.'" Hitchcock was not known for backing away from new technology: on the contrary, he had a history of using special effects, exploring rear-screen projection, matte, and other techniques that enabled him to present his material in unusual ways. In DIAL M, he handled 3-D in his own masterful style. Every shot was carefully composed so that, with proper camera movement and very precise convergence, virtually error-free 3-D was achieved. Hitchcock’s daring use of unusual techniques makes this a landmark 3-D film. DIAL M contains several outstanding examples of 3-D virtuosity. First are the tight “macro” close-ups on wristwatches and, second, the ultra-close shot of a telephone dial as Ray Milland’s right index finger pokes into the number 6 hole, the “M.” Both shots were faked. With the camera system, it was impossible to achieve the type of tight close-up Hitchcock felt he needed to enhance his story. He had, for virtually the same technical reasons, used a similar device in SPELLBOUND (1945) for a scene in which Ingrid Bergman was held at gunpoint: Hitchcock’s solution to having both the gun (in the foreground) and Ms. Bergman (in the background) in focus was to have a giant hand hold the gun. The same giant prop technique was applied to DIAL M, making it possible to manage ultra-close-ups without inflicting eyestrain, and demonstrating Hitchcock’s undisputed genius for outwitting the limitations of the mechanical devices he worked with. Hitchcock’s most obvious and effective 3-D moment comes during the murder itself. As the murderous intruder attempts to strangle Grace Kelly, she is forced back across her desk, and her frantic hand thrusts out at the audience as she tries to reach the scissors to defend herself. Hitchcock triumphs again. "It was those early rushes. They looked so odd--skimpy, un-finished--." And Hitchcock, who received his first screen credit thirty years ago as an art director, started to sketch one of the first scenes on an old envelope. "See here--these spaces on the sides--do you notice how empty they are--how bare? Well--it took me days to discover just what was wrong. Look at this--this is the flat picture--the way I used to prepare a scene. If I had three people in a scene, one up front, one slightly back, and one seated in a chair in the back of the frame. In the finished shot they'd all be up front anyway. You got no illusion of depth. Now, of course, with this 3-D thing, you have to watch out for that or you get what I got at first--lots of waste space on the sides, on the top. all around." After Hitchcock's first shock of discovery, the early rushes were destroyed and he started all over again. "Tremendous new problems with this medium. And most of them in the hands of the director. Don't let any of these actors tell you it's difficult--different. It isn't--not for them. In fact, 3-D even makes them look thinner!" The studio has provided him with a brand new and improved kind of three-dimensional camera for which he has great respect, but no sense of aesthetic appreciation. "It's a big, gross, hulking monster. It's heavy and immobile and frightening. Why--for one of my best scenes--where one of the leading players falls on a pair of scissors and kills himself--I couldn't even get this--this--thing under the scissors to create the illusion of the audience falling on those scissors itself. But we licked it. We built a big hole right under the stage and submerged the camera--so even though there will be no rocks thrown out of the screen, I don't think anybody will go home disappointed." Interesting to note that the POV shot described by Hitchcock was not used in the finished film. In the meantime, interest in 3-D movies was beginning to diminish at the box-office. The full details can be found in What Killed 3-D? Re-takes were done on November 12 and the film was put into post-production just as 3-D enjoyed a brief resurgence in popularity. Movies like HONDO, KISS ME KATE, MISS SADIE THOMPSON and CEASE FIRE did excellent business throughout the winter months of 1953/54. However, by the spring, 3-D movies were on their last legs. The studios had stopped shooting in the process in late October and the few films still on the shelf were released flat or had very limited 3-D bookings. The first test preview was held on February 4 in Huntington Park, CA. On March 10, Army Archerd reported in Daily Variety that “Dial M will go out in 3-D.” Warner Bros. ad campaign was designed in a way to make the 3-D tagline easily removed. Posters were made for the flat version, and a specially prepared snipe would be affixed for any 3-D booking. Warners initiated a very aggressive marketing campaign and placed two page ads in the trades on April 10, April 17, April 24, May 1, May 8 and May 15. All ads state "Perfect 3 Dimension in the Hitchcock Manner!" It's worth noting that no other Warner Bros. film at that time had received such extensive pre-release advertising. On Monday April 26, DIAL M was previewed in 3-D and widescreen 1.85:1 in 29 key exchange cities (Charlotte, Pittsburgh and Seattle ran it flat) as part of Warner Bros. new product seminar. According to a May 1 article in Boxoffice, the film was seen on that day by an estimated 7,500 exhibitors. Theaters around the country booked the film in 3-D for its Memorial Day opening. Trade reviews hit the following day and the first one to appear dramatically illustrated the projection issues that had effectively destroyed the public's interest in 3-D.
How could a reviewer properly asses the quality of the 3-D cinematography if the presentation was poor? This happened quite often during that time and was the primary reason for 3-D's quick demise. 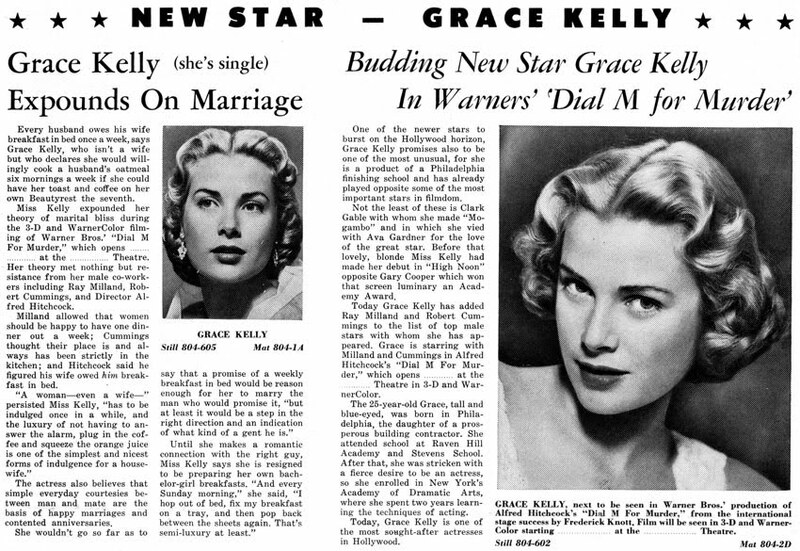 The World Premiere took place in Grace Kelly's hometown of Philadelphia on Tuesday, May 18 at the 2,200 seat Randolph Theater. They had installed a new 72 x 30 foot Panoramascope screen in June of 1953. In addition to the giant silver screen, it was one of the few theaters in the Northeast with four projectors in the booth so they were able to run a 3-D film without the usual intermission. After one preview performance on Tuesday and four showings on the 19th, the manager frantically contacted the studio and said that people were staying away in droves. He asked for permission to drop the 3-D and show it flat. On Sunday May 23, a Philadelphia Inquirer headline proclaimed: "Play's the Thing as Philadelphia Fans Spurn 3-D for 2-D Version of DIAL M." Mildred Martin wrote: "The first audiences proved to be a jury that could not only make up its mind, but could make it up in a hurry. In exhibitors' own terms, DIAL M literally died. And after just four performances on Wednesday, some long-distance telephoning to report complaints, the increasing skimpiness of customers--a good many of them making no bones of their dissatisfaction--permission was given to throw away the glasses and hastily switch to the 2-D version. Whereupon business at the Randolph took a turn for the better." According to Variety, the first week was "boffo" with a gross of $28,000.00. (The ticket prices ranged from .74 to $1.30.) The film eventually played the Randolph for five weeks with an impressive total gross of $67,500. On May 26, a Variety headline announced 3-D Looks Dead in United States. Theaters which had promoted it as a 3-D release quickly modified their advertising to state "See it without glasses!" As an example, the ad on the left is for the May 27 opening in Washington, DC. On June 3, Walter Winchell wrote in his popular, syndicated column, "Trade papers report that the 3-D version of DMFM was dropped since the tri-dimensional gimmick is now considered a box-office liability." Warner Bros. quietly dropped all references and the next industry trade ad on June 5 does not mention 3-D. However, the film was still available to any exhibitor who wished to show the depth version. One theater that played it from June 6-8 is the 650 seat State Theatre in Kingsport, TN. The newspaper ad includes the "Perfect 3 Dimension" tag and mentions "Viewers 10c Extra." The 3-D version effectively disappeared after those few 1954 play-dates. Jack Warner, 3-D's staunchest advocate, finally gave up at that point. Warner Bros. last stereoscopic feature, THE BOUNTY HUNTER, was released flat only in September 1954. In January 1979, Tom Cooper was managing the popular Tiffany and Vagabond Theaters in Los Angeles and approached Warner Classics about striking a new dual-strip 3-D print. On August 27, the Village Voice reported plans for a single week premier engagement at the Thalia Theater on 95th Street in New York. However, the booking was canceled due to problems at the film laboratory with the original negatives. A subsequent article in Variety discussed the poor condition of the 3-D elements. It's interesting to note that the negatives were only twenty-six years old and already had issues with fading. Keep that in mind as we discuss the recent restoration. The new dual-strip 3-D print premiered at the Tiffany in West Hollywood on November 1, 1979. Variety reported it would next open at the Davis Theatre in Chicago for Christmas, and then into other theaters equipped for dual-strip 3-D in San Francisco, Seattle and Coconut Grove, Florida. It finally premiered in New York City at the 8th Street Playhouse on March 28, 1980. Encouraged by the successful repertory bookings around the country, Warner Bros. converted the dual-35mm to a single-strip side by side Stereovision print which was released in February 1982. Unfortunately, the image quality was very poor. Bad alignment, a dim picture and fading yellow-tinged WarnerColor presented audiences with a stereoscopic image far removed from the original vibrant dual-strip widescreen 3-D version. Major theaters began installing the new screens in the summer of 1953. A December 5, 1953 survey of 16,753 operating indoor domestic theaters showed that 80% of downtown theaters and 69% of neighborhood theaters had installed widescreens. In total, 58% of all U.S. theaters had gone widescreen by the end of 1953. The conversion was slow in the Southern and North central parts of the country and that’s why the films were still protected during photography for the standard Academy ratio. Additional information on the dawn of widescreen can be found on this page. Following a three month studio shutdown, Warner Bros. resumed production on July 14, 1953. All subsequent features were composed for widescreen and DIAL M FOR MURDER was the fourth film to start production under this new policy. In August 2011, Warner Bros. began an extensive restoration from the original 35mm elements. The 3-D Film Archive supplied documentation which confirmed the 1.85:1 aspect ratio. The following technical information will help you to fully understand the many challenges faced by the restoration team. WarnerColor had been developed over a twelve year period under the supervision of Col. Nathan Levinson of the Warner Bros. sound department and Fred Gage, head of the studio's film laboratory. The new process was first seen in April 1952 on THE LION AND THE HORSE. (In a July 1 letter, Col. Levinson stated the process was “merely the use of Eastman color film stock...adapted to our techniques.") Shot on Kodak’s Eastman color tri-pack 5248 negative (25 ASA tungsten) it presented a low cost alternative to the elaborate three-strip Technicolor system. For 3-D WarnerColor productions, fades and dissolves would be edited directly into the left/right camera negatives from cut to cut, thereby eliminating a visual jump in quality by suddenly appearing mid-scene. In other words, the intermediate footage lasts from the scene preceding to the scene immediately following the optical. Some of these shots can last well over one minute in duration. According to "Hollywood's Conversion of all Production to Color" by John Waner, WarnerColor opticals were made by taking the 5248 camera negative, creating separation positives on 5216 and then going back to a composite color internegative on 5245, all via modified step-registration. Eastman, in their rush to release a tri-pack color element to the market, did so without first creating good intermediate stocks (including interpositive and color dupe negative) as well as high quality panchromatic high-contrast clear-base black and white stocks. Technicolor had solved this problem with opticals many years earlier, but they were not about to share their trade secrets with other laboratories. All WarnerColor films suffer from these problems, most notably A STAR IS BORN and GIANT. In addition to color issues, occasional malfunction of either the left or right cameras during filming would necessitate duplication of the opposite element for insertion into the negative. The image would be slightly offset from the opposite side, creating a faux stereo window, but the scene is flat nonetheless. For those reasons, 3-D WarnerColor negatives contain a higher than average amount of dupe footage compared to other color films of that time. As an example, the original negatives of HONDO contain 2019 feet (22 minutes, 26 seconds) of intermediate stock. That’s nearly 1/4 of the film. Not only are these sections several generations removed from the camera negative, they are also prone to more severe fading. In conclusion, restoring a 3-D WarnerColor film is no easy task. Vertical misalignment is the most well-known 3-D distortion. Human beings view stereo using horizontal parallax, given our eyes are displaced horizontally. But vertical misalignment forces our eyes to adjust in a way they are not normally accustomed to doing. In a worst case scenario, this type of misalignment forces our eyes to move up and down instead of left and right. How well a person can handle these problems depends on both the severity of the distortion and the tolerance of the given viewer. Some are able to handle this eyestrain better than others. In addition, there are other types of 3-D distortions that can effect our viewing experiences as well, making some shots or sequences difficult to view. Quite often, the viewer will have a feeling that "something isn't quite right" even if they don't know what is causing the problem. Sadly, even today's digitally shot main-stream 3-D features still suffer from occasional misalignment errors. With the 1950's Golden Age titles, some of these distortions were not easily correctable at the time. However, with current technological advances, these elements can now be properly aligned to look better than they did in their original 35mm dual strip polarized showings. Unlike the recent CREATURE FROM THE BLACK LAGOON 3-D Blu-ray presentation, 98% of DIAL M's stereoscopic alignment is essentially perfect. For those occasions where it is off, it is so mild that it should not cause the viewer any distractions or eyestrain. It is worth noting that the original elements were not error free, so Warner Bros. has clearly done their homework, and has done it exceptionally well. There is only a single shot in the entire Blu-ray with a moderate amount of misalignment (a quick shot of phone relays triggering) that is easy to overlook. In a few very brief scenes, there is minor to moderate haloing with certain higher contrast shots, typically in the sections where dupe elements have been used, and more so on the right eye side. These halos are not ghosting, nor 3-D related, and are still evident in 2-D viewing. They are a limitation of the WarnerColor optical intermediate process and have been a part of the film since 1954. Levels appear to be fine, although I could understand if it may come across a tad darker on some active displays. Original 1954 release prints were similar in timing but were projected with dual carbon arc illumination resulting in a brighter image on screen. Viewing this 3-D Blu-ray on a passive display showed no appreciable light loss. When viewed on a DLP 3-D front projection system, the active DLP-Link glasses were ever so slightly darker than the passive displays, but was not a deterrent. The big screen viewing was still an enjoyable experience and, due to the 135" projected image size, in some respects was preferable as it was a closer approximation to what was seen theatrically. Many of the Optoma DLP projectors run their bulbs by default in high power mode when viewing 3-D content and most DLP-Link glasses do not incur a drastic light reduction compared to some active glasses, so individual systems and types of glasses may vary. The image presented on the Blu-ray is 1.78:1. While it is not disruptive to the flow of the feature, it is worth noting at 1:28:49 and ending at 1:30:20, there is a brief 2-D section. This also appeared in original dual strip prints as well, and likely has been that way from day one due to a camera malfunction. As with all 3-D Blu-rays, the left and right images have 100% separation, so any perceived 3-D ghosting will be a result of the display device and not the source material. When viewed on a passive display, DIAL M had a few very brief incidents of perceived ghosting, none of which were outright distracting. When screened on a front projection DLP 3-D set-up, the stereoscopic image was 100% ghost free. Warner Bros. appears to have retained the original 3-D convergence. If something is placed behind or in front of "the stereoscopic window," that is how it was planned by Hitchcock and Burks. With any 3-D title, adjusting the original convergence sometimes needs to be addressed, but doing so can inadvertently change a number of shot compositions for the worse. If Warner's has done any shifting of the stereo window, it has been done thoughtfully and with respect to the source material. Also being true to the 1954 3-D presentation, the original intermission card has been retained. At that time, the average projection booth had either two or three projectors. For dual strip 35mm 3-D showings, two projectors were utilized for the first half of a 3-D feature. The intermission would allow both projectors to be threaded again for the second half of the feature. The filmmakers knew this and usually took great care to place the intermission at a crucial point in the story. Aside from the intermediate element issues, DIAL M does not appear to have had excessive DNR meaning that 35mm grain structure has been retained. The color has been faithfully restored to its original palette, and the widescreen 3-D image is an accurate and faithful representation of what Alfred Hitchcock intended the world to see nearly sixty years ago. Warner Bros. has truly done an outstanding job with this restoration. The 3-D Film Archive highly recommends this superb Blu-ray release. For additional reading on DIAL M, we highly recommend this article by David Bordwell.